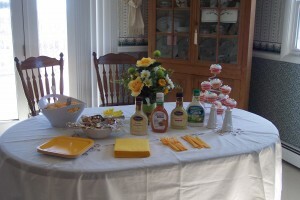 This past Saturday, the Heavenly View Book Club met for its Winter book review and lunch. What a great time we had. The day was beautiful and so appreciated as we have just come out of the worst winter in my 22-year memory here in the mountains of northwestern NC. Lunch was excellent and Spring was in the air and definitely made an impression on the serving table as you can see in the picture. The book selection was He Loves Me, by Wayne Jacobsen. A great life-changing book! If you are looking for a read to encourage and lift you up, this is the book for you. The first few chapters won’t change your life, but then comes chapter four and wham…whatever you want to call it, a-ha moment, epiphany, revelation, it happens and then you are drawn to continue reading until your eyelids droop! 23 chapters later and it is as real as the air we breathe, God loves me – nothing I do or do not do will cause Him to love me more or love me less. 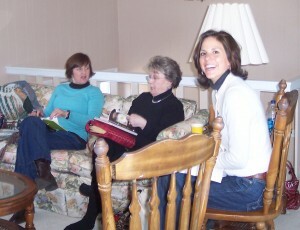 The Heavenly View Book Club was formed one year ago and began with five women ranging in age from 36 to 61. Now, our group boasts nine members and we are hoping to invite more readers to join us. Membership requirements are simple – female, a love for rea ding, and a hunger to learn more about the awesome God we serve! We take turns facilitating and review always involves a rabbit trail or two but all-in-all, we cover the book and gain insight from others. We always choose the next book and pray together before we end our special time together. Are any of you involved in a book club? I’d love to hear about it and we can always learn new methods and ways to conduct our time together. I am Rejoicing in HOPE!